Klara Celebrates Her First Birthday! 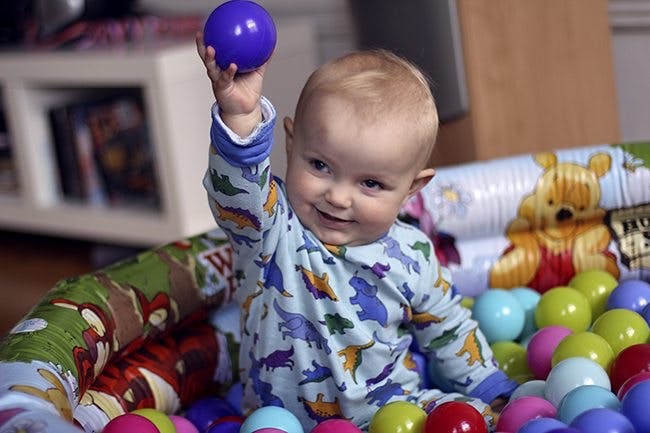 Yesterday our charming Klara had her first birthday and celebrated in her new ball pool, slightly bruised from having climbed everything and from learning to walk a bit. A lot of people ask me what she eats. The simple answer is that she sits at the kitchen table with us and eats the same food. However she gets a bit more slow carbs (e.g. more fruit and some more root vegetables, potatoes and berries). A very liberal LCHF diet. Also she still breast feeds once in a while. Without much planning the entire year has passed without a single can of baby food, or any of the grain-based gruel or porridge that are popular in Sweden. In fact she has hardly eaten anything with flour in it. In Sweden we get insistent advice to feed babies industrial porridge with added iron. We ignored that, seemingly without any negative effects. Klara gets her iron from real food like meat and vegetables. Personally I wonder if porridge with added iron could result in constipation. That is the most common side effect of iron supplementation to adults. So how is Klara developing after a low carb pregnancy and one year without processed sugar and almost completely without grains? Just fine. She just learned to walk and she’s been talking a bit since she was 8-9 months old. Now she says quite a few words. She’s way above average in both weight and height. And she’s full of energy and almost always happy (something that’s frequently commented on by other parents). Yes, I’m a proud dad. There was no cake baked on flour at her first birthday. But Klara seemed completely satisfied with a fruit salad and real whipped cream. What do you think about a liberal LCHF diet for kids? PS: The only supplement she gets apart from good food is vitamin D, every single day. About twice the recommended dose, 800 – 1000 units per day. PS2: Here are recent reports on more kids raised by low-carbing doctors: Jay Wortman’s two kids and Peter Attia’s daughter. We have our son on a very strict LCHF diet. He's been eating this way since he was 3.5 (now 7) when we suspected he had autism. Within a month he went from 2 word utterances to speaking in full sentences, he started looking us in the eye and holding our hands when we would go for walks instead of ignoring us and pushing us away. His agressive behaviours stopped and he was a happy, healthy child. In short, we got our son back. It's been nothing short of a miracle. Since we live in Sweden and would normally be forced to allow the daycare/schools feed our son during the day, we needed a diagnosis for him to receive different food. So we agreed to allow him to go back to eating a "normal" diet for 4 months so he could be diagnosed. Those were the worst 4 months of our lives. Our son, who had almost no outward symptoms of autism was now spinning, banging his head, lining up toys and having several meltdowns a day. He was difficult to talk to and life was generally hard on whole family. It was heartbreaking. He, of course, received the diagnosis and we are now 'allowed' to provide all his food for school. Back on his special diet - very strict LCHF - his symptoms are gone again and he is a happy, pleasant boy who concentrates very well at school. Do I believe in LCHF diets for children? I believe they are essential. future swedish hand ball player? Happy Birthday to Klara! What a precious, healthy girl. When my boys were babies, a million years ago, I wasn't on low carb. The food pyramid hadn't been invented yet and nobody thought whole grains and a ton of fruit were the be-all-end-all of food for humans. I had a little baby food grinder and though we did occasionally have baby food (didn't know any better) my boys ate mostly real food that I ground up at the table. I also brought it to restaurants when we ate out. Just had to order a cup of vegetable soup or the vegetable of the day, ground up the veggies a bit, ground up a small piece of chicken or seafood (whatever I was having) and voila...baby meal! Keep up the good work Doc! I'm doing the same for my 16-month-old daughter. I was unsure at first at the beginning and still gave her a few grains, but I stopped it and we are all grain-free now. She is really crazy about fruit though, and cheese. Once in a while I mix some full-fat milk with a lot of water and she drinks that, but mostly she gets plain water. We had a coconut flour cake with strawberries on her first birthday. She enjoyed it, but she seems to love meat just as much. I feel lucky that she is willing to try everything, especially what we are eating. Simply adorable. In the fifties - when I grew up - it was still normal for children to simply eat what their parents ate once they were weaned. Special foods for children had not been invented. Simple, straightforward homecooked fare. Ahhhh! What a cutie! Makes me wish my boys were still babies. Enjoy this time, Doc. They do grow so very fast. She'll be cutting her own ribeye with her own steak knife soon. My children's lives would have been so much different had I known then what I know now. I regret every day that I was so brainwashed by conventional medical advice. They are both now successful adults, but I can only wonder what more they would have accomplished had childhood and adolescence not been marred by unmanaged insulin-resistance. They both still carry scars from the bad effects of the diet their misguided parents foisted upon them. In the case of my son, "ADHD" caused him academic and social struggles. My daughter suffered from severe obesity, eating disorders, depression, and insomnia. Her "scars" are not just metaphorical, as she had to have skin reduction surgery following a 150 pound weight loss (something that is rarely discussed as a consequence of major weight loss). The good news is they are both following low-carb/paleo diets and most of the problems of their past of been completely resolved! Klara is so fortunate to have been born in a better place and time. Thanks, I added that link above, as well as to dr Peter Attia's recent post on the same topic. O.T. but did you see this? Congratulations from Finland! We are couple eating LCHF and actually my wife is italian. Can you believe, italian without pasta and white bread! It's possible! One thing came to our mind, how you gonna solve the food thing later when your daughter is in kinderkarten or in school? We have a great kindergarten lined up already. Not quite LCHF but certainly not low fat. You and your adorable daughter are setting the pace for the next generation, a generation that will no longer participate in the world's worst epidemic of obesity and diabetes! Happy Birthday, Klara! The first year is truly an amazing experience . Since starting LCHF in May, I have lost 25 pounds. It's truly been a life-changing experience for me. 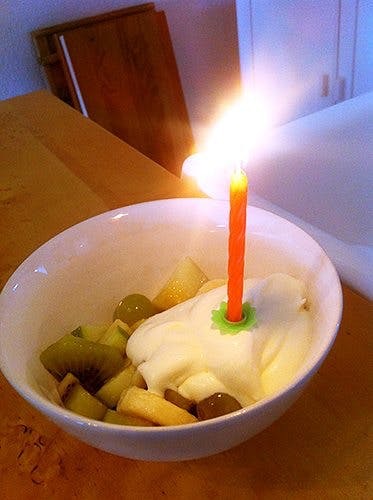 My twin boys who will turn 3 in November are also eating a similar diet to Klara's. They still eat some fruit and some slow carbs on occasion. They are also doing great. They are healthy, happy, and actually prefer this diet to what they were eating before. My daughter is about to head off to school today with her first LCHF lunch. Normally she has the school dinner - but is always hungry when she gets home. Today she is having some fruit, nuts, mini sausages, avocado dip with vegetables and a square of 85% dark chocolate. She is really excited as it is just so much nicer than what the school offers. I know she will be more full and there will be less chance of the stomach aches she often gets while at school. Klara is certainly very cute. There will be times when she will rebel and want foods which you don't approve of. But from my experience - they tend not to ask for what they have never had. In our family soft drink were never allowed and now even my 13 year old son prefers water. This is despite him having his own pocket money to buy whatever he likes. Our Lisa is now 7,5 months and is a LCHF baby from LCHF parents luckily also with a LCHF pregnancy as well. And she is happy and relaxed all the time as well. We did not start with real food she is still 100% breastfeeded. Everybody is telling us she should have real food now but she is happy and does not demand it. Why change anything? We have 100% faith in her and she will signal us when she wants anything else. Everybody is telling us as well (why do all the folks "on the wrong track" have so strong oppinions?) that we are so lucky with such a relaxed and happy baby. But this is not the exception. This should and could be normality! One experience I like to share: Lisa was 2,8 kg (regarding the doctors "underweighted") after birth and therefore the pregnancy and the birth was quite easy (if anyone just dare to talk about "easy" and "birth" :-)). Afterwards she gained weight so quickly only from mothers milk that she is now above average. This seems so damn right to us. I wish all the LCHF parents strenghts but also fun with your kids! I am looking forward to read further experiences. with you as her father it is not surprising she is above average in height surely?!! We are about a month ahead of you (in age) with our little boy. We feed him a liberal LCHF diet as well. Even though he has Cystic Fibrosis he is also ahead on weight and height. He is very much ahead in motor skills. He walked at 8 months and now he is climbing at 13 months. He only speaks a few words but his ability to figure his way around problems is remarkable. We certainly credit his diet to his advanced nature. We feed him a diet free of wheat and sugar with only some fruit. His diet is also fortified with fat. He eats coconut oil right off the spoon and looks for more. He gets lots of butter and olive oil too. This post is wonderful! I have a question about the vitamin D. In what form is the cod liver oil (I presume) you give to Klara? Gel, tablets, drops? Do you sneak it into food? How many teaspoons match the dosage of 800 – 1000 units per day? I'm expecting a baby and I've been using the Green Pasture blend in a gel form, and was wondering how on earth could I feed this stinking oil to my baby... :) How early can I start? Just precious! I think it's a great idea to avoid grains for babies & kids...they can avoid all the allergies & blood sugar issues from the start! Congrats & Happy Birthday to the adorable Klara!!! sitter och laser om lchf ocu autism. Hur gar det for er nu? Min son ar 18, och har diagnos sedan han var 7. Nu forsoker vi (har varit omojligt forrut) och han ar sjalv pigg pa att prova lchf tol. Hoppas pa flera positiva resultat med utveckling, mage mm. Det gick väldigt bra, faktiskt. Tur att din son vill prova kosten. Ju strikt (inga mejeriprodukter) man är desto bättre resultatet. Det har varit 5 fem sedan vi börjar äta lchf (när han var 3.5). Jätte nöjd! I guess we'll all keep learning as we go. My 4 kids were breastfed until they decided it was time to stop, which was a year to a year and a half. Before 6 mos., they had only breast milk. Seemed the natural thing to do. I'll never forget the way they dove into their first soft cooked broccoli! Breast milk tastes sweet and is full of fat, adapting the proportions during the feed, along with making antibodies as needed. But unless you had a beehive behind the barn, a taste for sweetness would wane. I think of a few weeks ago when I accidentally picked up my husband's coffee and had a sip -- the sugar tasted just awful! We acclimate. Pass me the heavy cream.